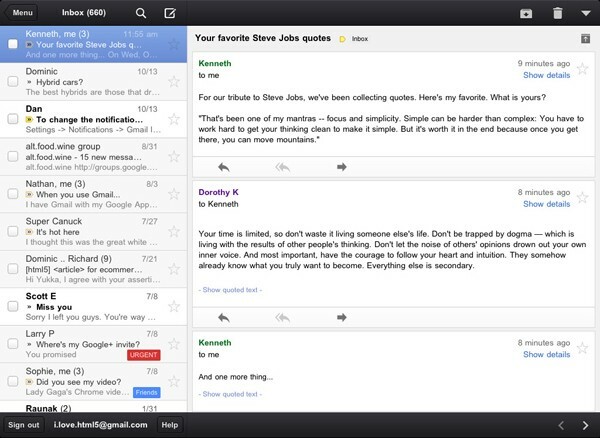 Google has released a native Gmail app for iOS devices including iPad, iPhone and iPod touch. Waiting. Walking. Watching TV. Working out. Winding down. Waking up. We check email pretty much everywhere these days. And when we do, we want easy access to our important messages so we can respond quickly and get back to life — or slinging birds at thieving green pigs. With that in mind, we’ve created a new Gmail app for iPhone, iPad, and iPod touch. We’ve combined your favorite features from the Gmail mobile web app and iOS into one app so you can be more productive on the go. It’s designed to be fast, efficient and take full advantage of the touchscreen and notification capabilities of your device. And it’s one more reason to switch to Gmail. The app brings new “time-saving” features such as push notifications for new messages; autocomplete email addresses from your Gmail contacts or select from your device’s address book; new attachment button to upload photos with one lick in compose view. In the iPad, it allows you to navigate your mails and read mails at the same time. You can download Gmail for iOS from iTunes or the App Store.